This exclusive and unique castle hotel in the center of Paris, near Les Champs Élysées; is old world charm at its best. To enhance their outdoor dining experience, they selected the Terrace Concept by Cuscini-Design. 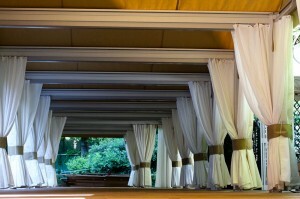 In their search for the outdoor pavilion, that would offer their clientele the unique culinary adventure, befitting the only château hotel in Paris; they found the Terrace Concept which met their every expectation. Eighteen units were configured together to fill their required space. They also had as a last request, a very special requirement; one of mobility. The Terrace Concept is an extremely versatile product. Not only does it offer elegance and a spectacular atmosphere, but practicality as well. The Saint James wanted the ability to move the project to another establishment in one to two years; thanks to its adaptable nature, the Terrace Concept was able to answer this special request. It can be dismantled piece by piece, all the while preserving its structural integrity as well as its aesthetics. One more successful Terrace Concept story.